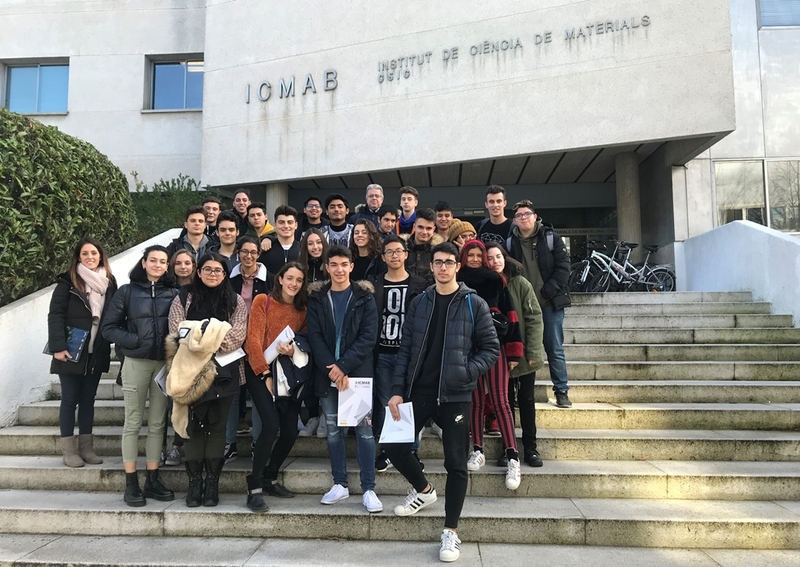 Nearly 30 students studying 1st BTX at the Centre d'Estudis Roca school came to our Institute, with two of their teachers, to learn what we do at the ICMAB. After a first introduction to the center by our Communication & Outreach Officer, Anna May, they could enjoy a talk by Mariano Campoy-Quiles, researcher at the Nanostructured Materials for Optoelectronics and Energy Generation (NANOPTO) group at the ICMAB, focused on materials for thermoelectricity and photovoltaics. After the talk, the students were divided into two groups, and were guided through different labs: the Scanning Electron Microscopy (SEM) Lab with Ana Esther Carrillo, where they could see some images of materials and other things; the Atomic Force Microscopy (AFM) lab with Andrés Gómez, where they learnt how it worked with our AFM-model, the X-ray Diffraction (XRD) Lab with Judith Oró, Anna Crespi and Joan Esquius, where they could learn the diffractin phenomenon used to discover the structure of materials, and the NANOPTO group, with Mariano Campoy-Quiles. Tots coincideixen en que els ha semblat una sortida molt interessant, el que més els ha agradat ha sigut veure com és realment un laboratori d'investigació i especialment els ha agradat la part de l'AFM (amb la maqueta van entendre molt bé el funcionament) i del SEM (els va encantar veure imatges reals i endevinar què era cada cosa).